Meadows. Absolutely move in ready and on a preferred cul-de-sac lot, this meticulously maintained well laid out home shows very well. Looks can be deceiving with respect to this almost 2000 square foot residence with modern laminate, tile and carpeting flooring throughout. The lovely main living area has vaulted ceilings with a front bay window showcasing the length of the neighborhood. The large enclosed Florida room overlooking the tranquil fully treed oasis is complete with distinctive hand-laid mosaic tile under a full-width retractable awning. The updated kitchen has stone counters, wood cabinets, a breakfast bar, newer appliances and larger closet pantry. Master suite has a spacious walk-in closet and full-featured master bath with soaking tub and walk-in shower. The 2 carpeted guest rooms located on opposite side of the home, share a bath. The inside utility room and attached 2 car garage enjoy additional storage spaces. This home has lush landscaping, insulation exceeding new home specifications, window storm shutters and protective window tinting for lower utility bills. 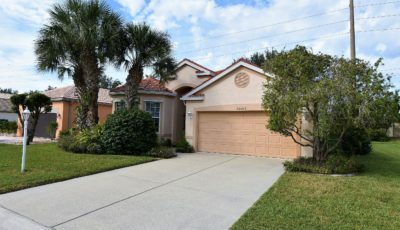 If you are looking for your place in the tropical Florida sun, you may have just found it here in Burnt Store Meadows.